Two of the owners of Satarah Wellness Marketing were arrested by operatives of the National Bureau of Investigation (NBI) in a resort in Anda, Pangasinan. Satarah Wellness Marketing is a marketing firm based in Baguio City that is linked to an investment scam operation that allegedly divested millions of pesos from its victims. The arrested suspects who are also sisters were identified as Romyllie Batolne Lau and Ruby Batolne. Romyllie is the wife of Wing Pan Henrich Lau who is the main suspect in the scam operation. However, the authorities fear that Henrich Lau may have already fled the country. After their arrest in Anda, Pangasinan, the two suspects were immediately brought to the NBI office in Baguio City. They will be facing syndicated estafa charges. According to the NBI, the company convinced people to invest in their business by offering high returns in short periods of time. The company allegedly promised up to 26% interest on new investments. One complainant said that for a a certain amount, his/her investment would earn 30% interest in just two months. It can be recalled that syndicated estafa charges were filed against Romyllie Batolne Lau, Claire Batolne, Henrich Lau, Michael Chayag Keryao, Ruby Batolne, Brigitte Batolne, Charles Batolne, and Ruben Dulay Jr. in October of last year. Ruben Dulay Jr. and Brigitte Batolne were arrested by NBI operatives last February in La Trinidad, Benguet. Rural Bank of Buguias Among The Victims Of The Scam? The Rural Bank of Buguias was shut down by the Bangko Sentral ng Pilipinas through its Monetary Board and was taken over by the Philippine Deposit Insurance Corporation (PDIC) in October last year. It turns out that the bank was also an investor in Satarah Wellness Marketing. The bank reportedly invested about 150 million pesos in the company. 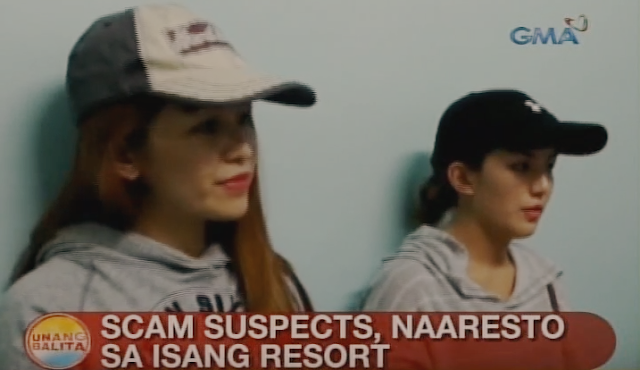 Screencapture of a news report by GMA News on the arrest of the two suspects. "The Securities and Exchange Commission has received reports that Satarah Wellness Marketing based in Baguio City solicit funds from the public on a promise of interests ranging from 4% to 26% "depending on the market rates", as well as from referrals of new investors, with referral rates ranging from 4% to 12% of the placement fees of new investors. Per verification, Satarah Wellness Marketing and its affiliates, Satarah Wellness International and Satarah Investment Group, Inc. are not authorized to solicit investments from the public as it did not secure prior registration and/or license or permit to solicit investments from the Commission as required under Section 8.1 of the Securities Regulation Code. In view thereof, the public is hereby advised to exercise self-restraint from investing their money into such high yield-high risk investment scheme and to take the necessary precautions in dealing with the above-mentioned entity. Should you have any information regarding the operation of the said entity, please call the Enforcement and Investor Protection Department at telephone numbers (02) 584-7187 and (02) 584-7652 or at SEC Baguio City Extension office at telephone numbers (074) 442-8170 and (074) 442-8171."